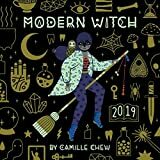 The modern witch is outspoken, engaged, savvy, and stylish, and artist Camille Chew has channeled these elements into her playful illustrations of witches in the high-spirited Modern Witch 2019 Wall Calendar. Each colorful monthly spread features a witch flaunting her mystical, street-style threads, accompanied by her familiar (that's her animal friend) and all the tools needed to practice her uplifting and transformative craft. 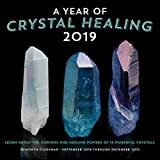 A Year of Crystal Healing 2019 explores the power of crystals with this 16-month wall calendar featuring images and facts on healing crystals and their properties. Feel the power of earth's magic core with A Year of Crystal Healing 2019! Using power crystals for their magic ability to focus, center, heal, and protect is more popular and accepted than ever before, especially among among celebrities and social media stars. Now, you can learn about the different classes of these healing gems with this 16-month calendar. Each month shows you a different full-color spread of different crystals, and captions listing their powers, appearances, and geologic make-up. The perfect gift for the spiritualist, burgeoning witch, or rock collector in your life, A Year of Crystal Healing 2019 will bring light and wonder to any room, all year long! 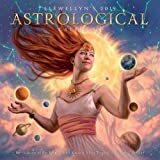 Using the energy of the cosmos to plan your year is easy with Llewellyn's 2019 Daily Planetary Guide, the most trusted and astrologically detailed guidebook available. Determine the best time to do anything on a monthly, weekly, and daily basis―and even down to the minute. Before setting up a job interview, signing a contract, planning a vacation, or scheduling anything important, consult the weekly forecasts and Opportunity Periods―times when the positive flow of energy is at its peak. Plan your year wisely according to aspects, ephemerides, retrograde planets, eclipses for 2019, and more astrological information. Even beginners can use this powerful planner, which explains the planets, signs, houses, and how to use this guide.